Perfecting the plan to persuade, protect and provide against the pervasive plot, all while producing a preventative to prime time propaganda. Your paranoia will be pulverized by proficiency. There’s no need to panic; here’s your host: Gabe Smith. Hey everybody, thanks for tuning in. 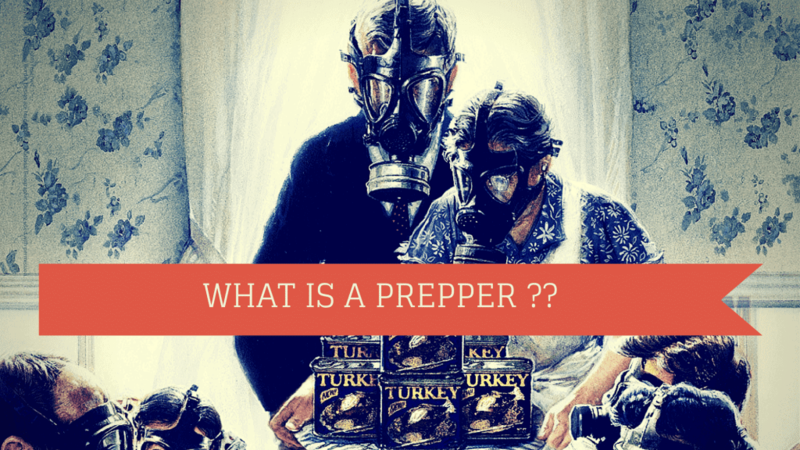 I want to talk to you today about what is a prepper? Is it someone with just a three-day supply or someone with a castle and a bunker out in the mountains?Or is it somewhere in between? I think back to my early childhood years, growing up in Louisiana. And one of the things we had to deal with there was a hurricane.I remember specifically Hurricane Andrew came through and knocked out our power.My family was prepared with water, food, bread, milk and flashlights, candles, the stuff we needed to get through a week or so without power, and that’s what we ended up doing. Growing up and learning more about prepping, I found that most Americans have nothing. If you’re in that scenario, and you don’t know what you’re having for dinner tonight because the pantry is empty, and you’re gonna make a run to the grocery store in just a few minutes, you might want to take note. Begin by stocking up your pantry. You don’t have to jump from nothing to Doomsday Prepper level overnight. It’s overwhelming, and just financially not doable for 99.9%of us. So, the way I began was each trip to the grocery store. Oh, the green beans are on sale? We’re grabbing a couple extra cans.Next week there’s rice on sale, we’re gonna grab an extra bag of rice. This stuff starts to stock up to where we’ve “deepened” our pantry and now we have a three-day supply and we can eat a lot of this stuff for three days, maybe a little longer without a trip to the grocery store.In addition to that there’s the importance of water and water storage- having enough water to survive. The average person needs one gallon of water per day if they’re being very conservative and very water conscious. That’s for their washing, food preparation, and their drinking. So one gallon isn’t a whole lot of water, when you think about it, if it has to cover all of those chores.You want to begin to build up your water storage and one simple way is to collect two liter bottles from soda. Soda is very acidic, so those bottles are made to last and they’ll last forever.That’s one of the reasons we want to recycle them, because they don’t decompose in the landfills. Fill them up with tap water.If you’re on city water, the water is already chlorinated you don’t even have to worry about adding anything to it.Tuck those away in a closet, dresser, drawer, under the bed, and you’ll be set for when that rainy day does come. Um the next part of it is; how do I go from three days? What’s the next step from there? And at that point you want to maybe deepen your pantry up to a seven-day, a one-week level. And begin to look at long-term food storage. This one-week level you will keep rotating through it with your regular shopping trips.Long term food storage you’re going to take and set aside and it’s designed to keep and it’s not going to spoil, not go rancid, and have bugs in it, etc. But you know, thinking back to my child hood as a young boy I was in the Royal Rangers. It’s kind of like a Christian organization like the Boy Scouts. And our motto was “Ready. Ready for anything. Ready to work, play, serve, obey, worship, live, anything.” I’ve taken that to heart and I think it influences my everyday life going forward from that time.In my car I have a little kit and I wanna have enough stuff set aside to take care of my family. Should there be a natural disaster, man made disaster, hurricane, terrorist event. We were driving through Colorado recently and there was a boil water advisory in a major town.This whole city of people was having to boil their water because something had happened, and having this level of preparedness where I can fend for myself for a week or three days or ten days, somewhere in there, is gonna keep me away from the masses that are running to the WalMart’s and the 7-11 trying to grab a case of water bottles before they’re all gone. There’s two major things that people go for. And so if you build up your supply now, you won’t be caught in the melee later. So in closing, I want to say having a little bit of something, makes you a prepper. And building on that makes you even more secure and having the knowledge to fight the fear that can influence and impact your life if you’re not prepared. I’m Gabe Smith, signing off, God bless and good night.